A new website for a changing and expanding museum. First established in 1924 as the Tucson Fine Arts Association, the Museum made its home in the Kingan House on Franklin Street in the El Presidio Historic District. In 1954 the association was officially renamed the Tucson Art Center to establish our exhibition and education mission. In 1975 the Tucson Art Center moved to its present location and became the caretaker of several historic buildings – and our name was changed to the Tucson Museum of Art to reflect our collecting activities. Today the Tucson Museum of Art and Historic Block encompasses an entire city block in historic downtown and features original and traveling exhibitions, tours, education programs, studio art classes, and Museum Store. With a new CEO in 2015, the Tucson Museum of Art set out to implement a new plan to expand their building and grow their audience—with the website at the center. Fulano was approached to help bring the institution’s website to the next level. Their main digital presence, the website, was difficult to update, parts were not working, and the design had not been updated for years. 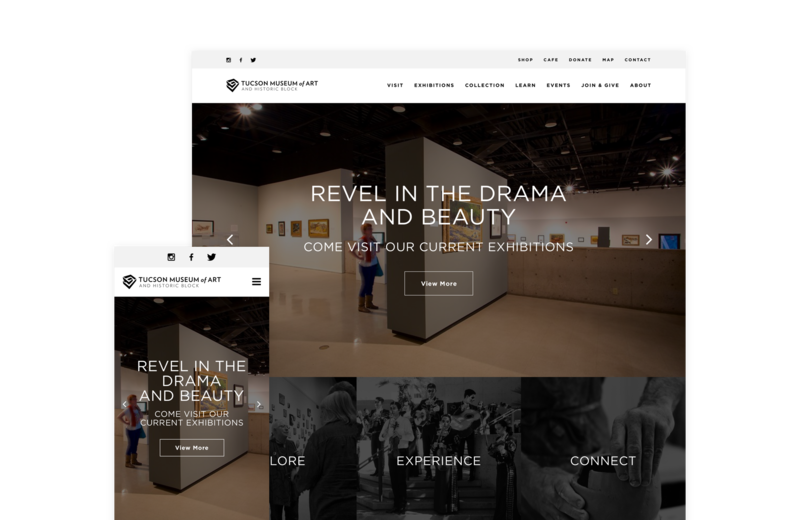 We worked closely with the Tucson Museum of Art team to develop a new digital presence that honored the existing museum brand, could be easily expanded and was user-friendly to staff and users alike.